Sophisticated meal that is very easy to make. 1. In a microwave oven process broccoli in a little water for 4 minutes on MAX. Drain and set aside. 2. Mix and combine corn flour, salt and pepper. 3. Dredge the veal chops through the mixture and sauté in butter and oil for about 4 minutes on each side or until golden-brown. Take them out of the pan and cover to keep warm. 4. In the same pan briefly sauté the garlic. Add broccoli florets and sauté briefly. Remove from the flame. 5. Bring wine and vegetable or chicken broth to the boil, add the pasta and cook for 2-3 minutes (or according to the manufacturer's instructions). Drain. 6. 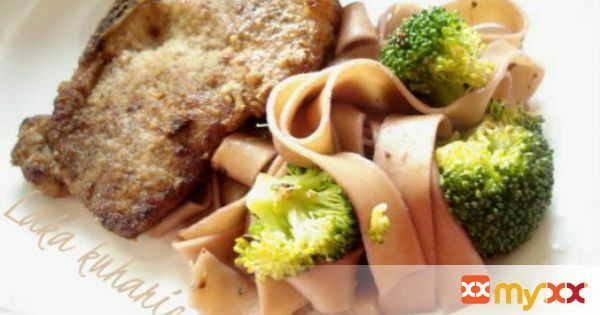 Mix pasta with the broccoli florets, and serve with the chops.